All transactions are safe and secure with a reliable history in online purchasing behind each of our associates. Buy the Laguna Beach Surf t-shirt to own Laguna Beach clothing and merchandise. Grab your longboard and head to the beach in this Laguna Beach surf tee. The design features a grey wave crashing toward an orange silhouette of a surfer holding his board. Wear this t-shirt for a friendly game of beach volleyball, or an afternoon of kite flying over the shore as you listen to the MTV Laguna Beach Soundtrack. If you run into Kristin Cavallari, tell her that Stephen said he is dunzo and ready to move on. 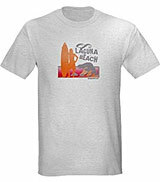 In addition to the Laguna Beach Surf tee above, browse the Laguna Beach Clothing Gallery for more apparel like men's and women's clothes, kids shirts or hoodies.